Weather: Front passing, just after a line of T-storms. Overcast to mostly cloudy with light showers at times. 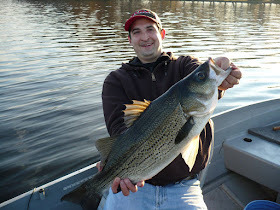 High 60's, wind calm to NE at 5mph and variable at 6mph. Relative Humidity: Over 90% all morning. Moon: Waning, Last Quarter. Overhead 6:43am. Set 12:58pm. Water Conditions: Good clarity to mildly stained. 75-76 degrees. Brown weeds, may have been nuked. 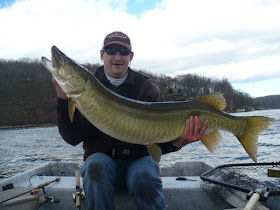 Although Joe and I started off our musky adventures together with a successful trip to the Allegheny River in December of 2011, we haven't had much to show for it since then. Joe has joined me on probably a half-dozen musky hunts in the last year, and the fish never seem to want to cooperate when he's with me. As if musky fishing wasn't complicated enough, we decided to get try to get Joe a musky on the fly. 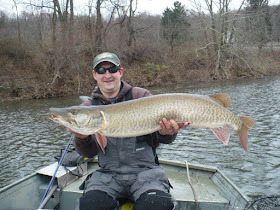 While I casted plugs and bucktails off the front of the boat, Joe was hammering away with huge musky flies off the back. 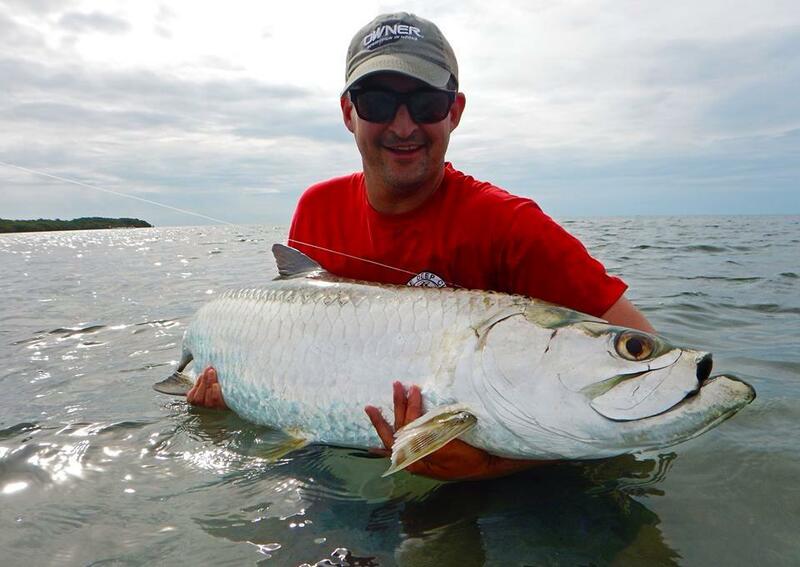 Scoring a musky on the fly is no easy task, but the reward is well worth the effort. Joe didn't score a musky on the fly on the adventure, but we did manage to break our bad our luck streak. Tiger muskies are special fish. 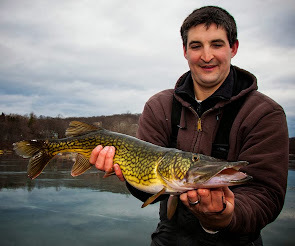 For those who do not know, a tiger musky is a hybrid cross between a northern pike and a muskellunge. 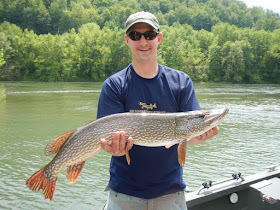 They rarely occur naturally in the native range of pike and muskies, but are bred by state fisheries for stocking. 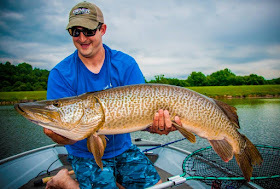 Tiger muskies are known to grow faster than true strain muskies, they cannot reproduce, they die younger and do not ultimately reach the lengths of pure muskies. 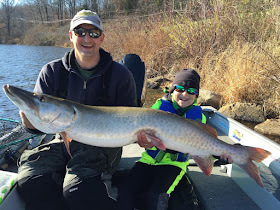 Because of their somewhat limited growth potential, a tiger musky in New Jersey over 40 inches is a special fish, and a tiger musky of 42 inches or over can be somewhat of a rare occasion. So the fact that I have now put tiger muskies of 42, 44 and 44 inches in my boat in just over a year is pretty damn cool. Joe and I didn't move a fish for 90 minutes on Friday. Then almost the minute to the major, I noticed something behind my bait as it was nearing the boat. 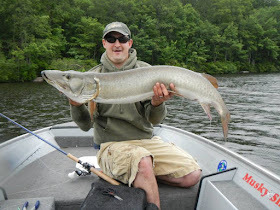 Since it was overcast, still early morning and because my vision stinks in low light, I couldn't tell it was a musky until it was right at the boat. I went right into a Figure 8 and the fish crunched it boat side on the first turn. 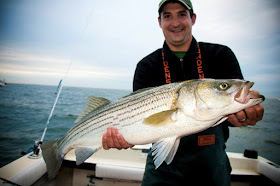 The fish took 3 deep runs, each time peeling a few yards of 80-pound braid from my cranked-down drag, but I was able to steer it around the boat in short order where Joe was waiting for the net. The second the fish hit the bag, I immediately saw the coloration and the size and knew we had just bagged a very big tiger musky. 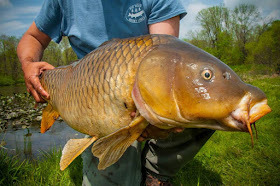 It was an incredible fish. We kept at it for awhile after that fish, but things didn't seem to be moving. 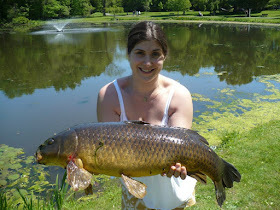 As we were thinking about calling it a day, I had another fish come in hot and eat on the Figure 8. I only had it hooked for a second and it shook the bait right at the side of the boat. It would have been nice to get that one too, but I wasn't going to complain. 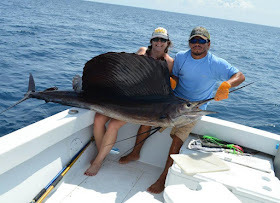 The fish I lost was probably 10 inches shorter and 15 pounds lighter than the one I caught, and it wasn't a tiger. This time, the big one didn't get away.